We at The Next Small Cap have covered off on Red Mountain Mining (ASX:RMX) before, and we continue to like what we see. Evidently, so do the money men, with a clear pathway to some solid funding over the coming weeks. 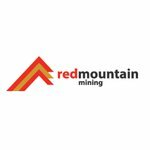 Red Mountain Mining (ASX:RMX) has just bagged the capital needed to get its near term gold production plans well and truly off the ground. This means this $2.87 million capped company is well on the way to being a gold producer – with 100,000/oz. of near term production, more to come and near-term drilling on the menu. It’s aiming to become a ‘ perpetual’ gold production machine – earning cash from production and using it fund further exploration. At the same time, this is a small, speculative mining stock – so caution is advised if considering as investment. The next step on the journey is to finish a Definitive Feasibility Study (DFS) and get additional drilling off the ground at a promising prospect, and RMX’s latest funding deal will do just that. In this article we’ll take you through the latest round of drilling, and why RMX is shaping up very nicely ahead of a DFS. For newcomers to the Red Mountain (ASX:RMX) story, we’re going to take you through a quick guide to RMX’s flagship Batangas Gold project in the Philippines. As things stand, the project has Indicated Resources of 2.97 million tonnes of gold ore at 2.4 grams per tonne of gold. Inferred Resources stand at 3.22Mt @ 2.1 g/t. This includes the very high grade South West Breccia resource of 221,000 tonnes grading 6.3 g/t – which essentially just sticks out of the ground. Taken together, this means the project has an indicated and inferred resource of 6.19Mt for a total of 444,000oz. With the current gold price at $US1136 ($A1593.70) an ounce, this could mean $637 million of revenue over the life of the project. RMX’s funding partner will eventually earn in to 50% of the project creating a 50:50 JV. Of course the above figures assume that the gold price stays the same, the exchange rate stays the same – and this is unlikely to be the case, so don’t take these numbers as gospel. For the meantime, RMX is looking at its Batangas Gold Project generating up to $67 million in operating cash flow, with $45 million in free cash flow over the first five years of the project. It still has to complete the DFS on the project, but it has previously come up with some early numbers – and the new funding should finish the DFS very quickly. The project itself is split into two parts – the Lobo and Archangel prospects, and we will get to them shortly – but the latest news at RMX is very much of the financial nature. We can talk about RMX all we like, but we here at The Next Small Cap don’t have millions of dollars to back our judgement. However, Bluebird Merchant Ventures will soon have this kind of cash – the company is set to list on the London Stock Exchange in a few weeks’ time. RMX recently told investors that the capital group would take a 25% stake in a key RMX subsidiary in exchange for US$ 1.7 million ($A2.4 million) in a staged funding deal which includes an initial US$ 1 million in funding for a 15% stake. That’s a pretty big vote of confidence from the capital group, which is also putting its skin in the game, but it also represented an uplift of US$ 0.7 million (A$ 1 million) from a previous version of the deal. This means that Bluebird thinks a stake in the RMX subsidiary is actually more prospective than it previously did. It also means RMX was able to swing a deal for 25% of its subsidiary at a value which is 85% of its entire market cap – which means RMX has shown the ability to swing a deal with major investors which come out in its favour. The deal essentially values a 25% stake in the project at US $1.7 million (A$ 2.4 million), meaning the overall project has an inferred value of US$ 6.8 million, which is A$ 9.6 million. Remember that RMX has a market cap of just under A$ 3 million, meaning that based on this deal, this project is currently worth more than three times its market cap. You can start to see some of the potential for growth in RMX’s valuation based on the Bluebird deal alone. However – there are no guarantees in life, and even fewer in resource investing – so caution is advised if considering this stock as an investment. The money should see RMX complete its DFS and bag all the required permits needed to get it to production. Meanwhile, a while back RMX ended up loaning Bluebird about US$ 850,000 (A$ 1.2 million), which is due back as soon as Bluebird lists. RMX is also due interest, but it’s hard to gauge just how much this could be. Earlier this month, it also announced that it received a R&D concession from the Australian government to the tune of A$ 337,000. It’s important to note that this refund plus the Bluebird loan will just sit in RMX’s bank account, and is essentially free capital. The Bluebird deal will pay for the work at Batangas, but this combined A$1.5 million will be free for RMX to use as it sees fit. This opens up a world of possibilities for RMX, and a world of rampant speculation on our part. Will it use the cash to drill more at Batangas, or will it use the cash to pick up another promising project in the region, or elsewhere? Only time will tell, and we can’t wait to see how RMX will use the extra cash. Now, the reason both RMX and Bluebird are progressing with this project comes down to the geology of course. As you can see from the map at the top of this article, the Lobo MPSA has the lower-sized resource, but the higher grade. According to its latest estimates, Lobo holds a JORC-compliant resource of 385,000 tonnes of ore @ 4.9 g/t for 61,000/oz. on an indicated basis, with a further 219,000t @ 2.9g/t for 21,000/oz of inferred. This includes the very high grade South West Breccia resource of 221,000 tonnes grading 6.3 g/t. It’s likely this higher grade gold will be mined first and processed, with the revenue from the project to fund further exploratory drilling both at Lobo and Archangel. As you can see above, RMX is planning to dig the high grade South West Breccia lode in two stages, with the first digging a pit down to just 30m. This will help keep costs low and get the ball rolling on the project. Once the ball is rolling and a little bit of money is coming into RMX, then it can focus on digging deeper to unlock even more gold and further exploration. RMX is shaping up as a “perpetual” gold machine . 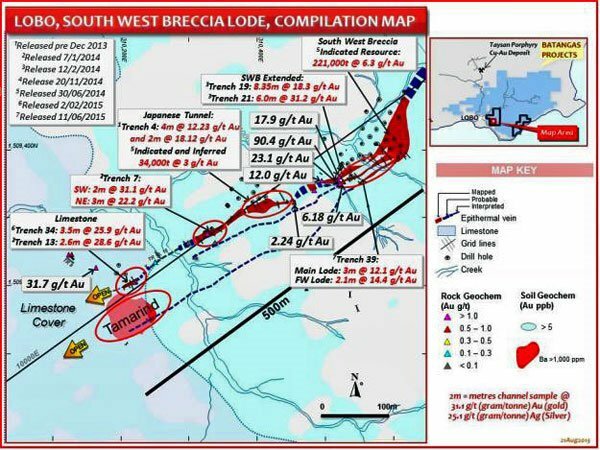 At the start of September RMX told the market that trenching on an extension of its South West Breccia (SWB) main zone had in effect firmed up a 40m strike length extension . 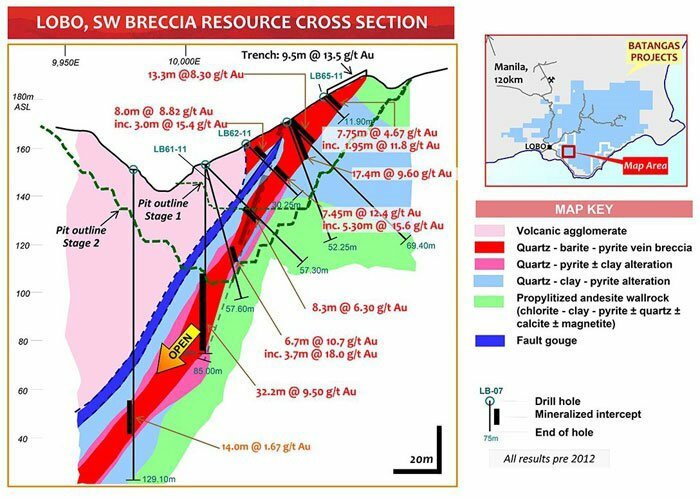 Grades from rock chip sampling and trenching beyond the South West Breccia Main Lode project area included very high grades at surface including 7m @ 20.5 g/t gold, 7m @ 11.5g/t Au including 1m @ 50.9 g/t Au, and even one hit of 151.6 g/t Au. The results are all from surface, meaning that again the possible extension is close to the surface (and cheaper to dig up). RMX is planning on further testing the extension with drilling, meaning there’ll be plenty of drilling for investors to chew on as the Company continues its journey to completing a Definitive Feasibility Study and getting all the relevant approvals in place. But it’s also thinking about another target at Lobo, one which is being thought about as a “SWB sized” target. RMX investors will undoubtedly be hoping Tamarind will be another tasty morsel for them to chew on, and while it’s very early days yet there are promising signs – and these signs could turn into something a bit more solid with drilling on the menu. Earlier this year it discovered an anomaly which RMX think may have the potential to be a “SWB sized” zone. Remember, SWB is the main game at Lobo, which in turn is driving all the early work and a feasibility study into mining at Batangas. Should RMX be able to prove up another SWB within earshot of it, then it could spell very good things for RMX and its shareholders. The Bluebird deal will allow it to sink an initial two drillholes at Tamarind, which will give investors more solid data to work from. We at The Next Small Cap have been following RMX for a while now, and we’re impressed at how it’s going about its business, moving through the phases to become a near-term gold producer. RMX’s drilling to date has brought up some impressive grades, and there’ll be plenty for investors to keep an eye out for as it moves towards releasing a DFS covering the project. 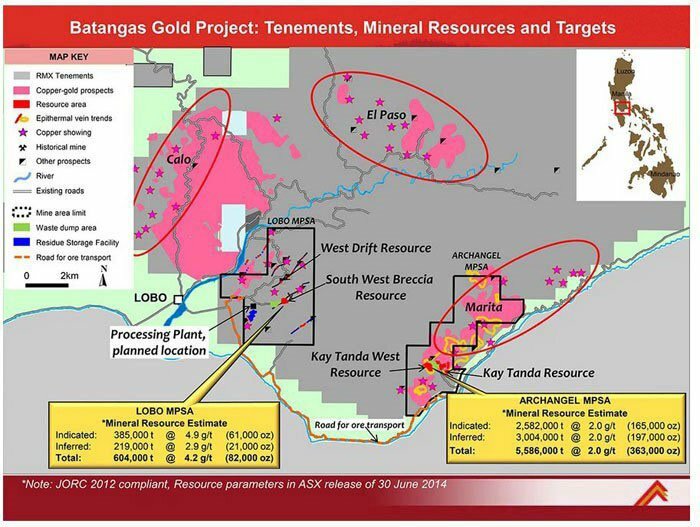 It’s impressive that a company of its size could soon become a gold producer from the initial 100,000oz from surface it is targeting, with RMX well on the road to doing that. Bluebird Merchant Ventures, which contains brighter minds than ours we’re sure, thinks so too and has agreed to pay over the odds and get real skin in the game to see RMX’s dreams achieved. Once RMX has production up and running, it will be in a position to fund further exploration off its own bat. RMX is doing so by focusing on high-grade and shallow resources in the first instance, and then using free flow capital to fund exploration for more high grade zones at depth and to expand the lower grade but potentially higher-volume resources nearby. We’ll continue to keep you update on RMX’s progress as it moves through the phases and continues its journey on the golden path. Are you an RMX investor and want to spread the word?